Where am I? Where am I? Where am I? Where am I? Where am I? Where am I? Calm down brain, you’re laying down. Do you remember down? Brain, we’ve talked about this. Brain, you’re going to have to figure this out. I know. It’s different. Down is still down, it’s always been down. Suit yourself, I can’t make you. Lying in a hospital bed with the lights off, my brain is screaming into a void. It doesn’t like the answer, or lack thereof, it is getting in return but it just keeps screaming. This is incessant vertigo. That is how it felt after surgeons cut into my brain to remove an acoustic neuroma. My brain was in a panic, trying to find its place in the world, but the input it typically relies on was damaged first by the tumor and then the surgery. There is no information streaming in from one of the usual sources, and my brain is having trouble coping with its loss. 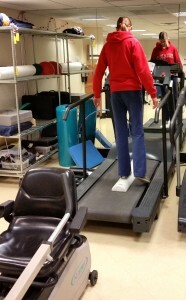 Rehab to regain my balance, trying to stand on one foot and tap the other in front of me while standing on a piece of foam (treadmill isn’t on). Photo by John Podolak. Of the 12 cranial nerves, the eighth controls and senses both sound and spatial orientation. An acoustic neuroma is a tumor that grows on this acoustic/vestibular nerve. Mine grew on the right, and so my hearing and vestibular system have both been damaged beyond repair on that side. The vestibular system is a part of your inner ear, and it works in concert with your eyes to sense your spatial orientation, giving you balance. It’s made up of two canals, and small crystals that move when you move and settle in response to gravity’s pull. Since vestibular function is closely linked to your vision, problems with this system are diagnosed by studying eye movements. Together your eyes and your vestibular system signal to your brain to figure out where you are in space. Vertigo, which I’ve explained as living in a world that won’t stop spinning, is a common symptom of vestibular dysfunction. However, not all vestibular problems result in vertigo, and you can experience dizziness and balance problems that aren’t vertigo. I’ve struggled to find what I feel is an accurate way to describe what vertigo is like, and to differentiate it from other types of dizziness. 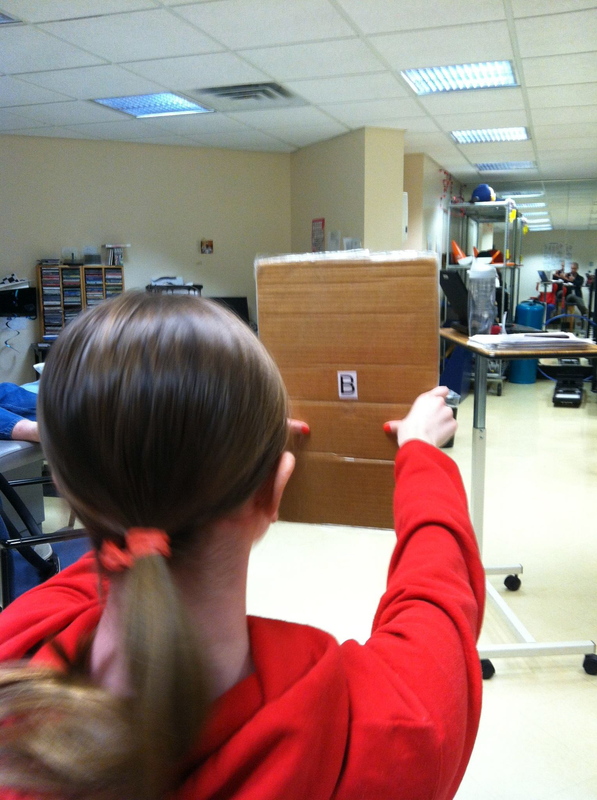 Prior to my surgery, I had a positive Dix-Hallpike test, which is used to diagnose vertigo. For this test you put on goggles that block out light and lean back with your head unsupported and turned all the way to the right or to the left. If you have vertigo, it will be triggered by this maneuver because, without input from your eyes, your brain struggles to orient itself. Immediately following the surgery my vertigo was more intense that I’ve ever felt it, to the point that I was constantly nauseated. That is when I started describing it as a world that never stops spinning, or constantly riding Space Mountain. I had been told to expect this, so, unpleasant as it was, at least it wasn’t a surprise. The spinning lessened everyday after the tumor was removed, and, around the four-week mark post-surgery, the vertigo mercifully stopped. I recently had another Dix-Hallpike test and didn’t register a response, which is great. I still have difficulty balancing, which is evident when I’m walking or going up and down stairs. If I try to walk with my eyes closed, it’s game over. Still, this is an improvement from the way things were in the hospital, when I couldn’t walk without assistance. I may wobble around like I’m hammered, but I can do it on my own. Vestibular rehab, which is a type of physical therapy, should help retrain my brain to balance. In some ways it feels like my brain is having an existential crisis, and, while I would like it to decide what it wants to do with itself, I know it takes time to adapt. Since the surgery was pushed earlier, it was only after the procedure that I started to process anything. Recovering from this procedure left me a lot of time to think, because I found it hard to focus on anything around me. Eyes closed, quiet, but awake, is a state I spent a lot of time in. Doing a lot of thinking, but not necessarily coming to terms with my feelings. People keep asking me if I’ve cried, or if I’ve gotten angry, but I’m not sure I’m sad or angry. I’ve had moments of course, and I get frustrated with myself when I struggle to do simple tasks, but I’m largely in good spirits. I feel lucky and loved more than anything else. No, not learning to read I’m practicing eye tracking to help with balance. Photo by Joe Caccavo. My worst moments come when I start getting down on myself for getting down. I’m impatient. I want to be back to normal. I want my life back. I want to be able to do things for myself. I want to walk without having to reach out and steady myself. I want to go back to work. I want my body back, because, in a lot of ways I feel like my body has been hijacked. Then I get annoyed with myself, because I’m going to get all of these things. I’m going to make a complete recovery, and it is only a matter of patience until I get there. I know I’m allowed to feel frustrated, but I try hard to maintain a realistic perspective about what has happened, and all the things that will happen because I’m still here. That leaves things progressing incrementally. I’m anticipating being back on my feet sometime in June, and am looking forward to returning to the science communication world. I’m still doing a lot of thinking, and have a lot of emotional processing left to do, but I get a little bit closer to coming to terms with it everyday. As I’ve been reflecting, there are a few things that I’ve taken away from the whole experience which are not particularly earth-shattering, but are certainly foremost in my mind. 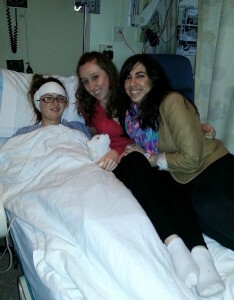 Before I left the hospital, with my sorority sisters. One of us isn’t looking their best. Photo by John Podolak. First, as much as this happened to me, it happened to everyone who loves and cares about me. I’m so grateful to my friends and family for dropping everything to be at my side through all of this, and I think it is important to remember that this was traumatic for them. My parents keep talking about what I went through with the surgery, but I can’t imagine what they went through, watching the clock, waiting for news as an entire day slipped away, far longer than anyone predicted. I didn’t come out of the operating room until well after 10pm, and I know friends scattered across different cities were up watching their phones, waiting to hear how it went. I missed the majority of the drama either unconscious or blissfully unaware thanks to painkillers, so I think they had it worse. I’ve experienced such an outpouring of love and support, and have been so well taken care of – but caretakers need care too. Second, never underestimate the power of an excellent nurse. I had two absolutely fantastic surgeons, and my primary care physician is awesome, but I also had terrific nurses. The nurses were always there, answering the majority of my questions (or helping me get the answers) for everything from tracking down my missing shoes to explaining what kind of medications I was taking and why. I know my Mom made a lot of late night phone calls to the hospital to check on me, and the nurses always fielded her inquiries in a calm and positive way. My nurses were all pretty awesome, and it made an unpleasant hospital stay that much more bearable. Third, young and completely healthy isn’t protection against a medical emergency. You may be fine now, but life could have a curve ball headed your way, and you need insurance. I can’t even begin to imagine this experience without health insurance. I haven’t received the bill yet, but the costs associated with my care are going to be astronomical. Knowing I’m lucky enough to have primary and secondary insurance to help cover those costs has been such a relief. Fourth, I have a new appreciation for what it is like to not be able to do something. I know I’ve said before that I can’t do something when really either I won’t, or just don’t want to do it. Having now experienced what it is like when you really can’t do simple things, I don’t think I’ll be mischaracterizing my abilities again. I also have a new appreciation for what a luxury it is to be able to sweat the small stuff. If your life is such that you can get worked up about things like traffic or a last minute meeting, you’re doing pretty darn well. There is so much that now seems like a waste of time or energy. It’s a trite truth that you don’t know what you have until you almost lose it, but I certainly have a renewed appreciation for all the good there is in my life. The last thing I’ve been cogitating on (for now) is how important it is to trust yourself. I knew that something was wrong with me, long before I was actually diagnosed. I dismissed my symptoms for a long time, suffering through them rather than facing the reality that something serious could be wrong. Naturally, I’ve been blaming myself that things became as dire as they did, but I’m coming around to the idea that beating myself up about it isn’t exactly productive. This started out as dizziness and headaches, which could have been so many things besides an acoustic neuroma. It’s not surprising I and everyone I talked to about it brushed aside the idea of a tumor. It’s important to be your own advocate, and find a doctor that will listen to you. The first hearing test I took said I was fine, even though I knew I wasn’t. I’m so grateful to my primary care physician for listening to all of my symptoms and pursuing my case with a CT. She might not have been the one making the cuts, but I don’t think it’s a stretch to say she saved my ability to move my face by making sure I was diagnosed properly. What I’m taking away most is that you can’t hide from your health, and if you try, it’s likely to come crashing through your life like a hammer. I’m just glad I’ve got a chance to pick up the pieces. What follows in this three part series is a personal narrative. All of the decisions I’ve made about my health were chosen in close consultation with medical professionals. My choices are mine, and not necessarily right for anyone else even with the same diagnosis. If you have concerns about your health I encourage you to seek out a medical professional, which I’m not. “When you hear hoof beats, think of horses – not zebras,” is a widely known version of a quote attributed to Theodore Woodward, MD, late professor at the University of Maryland School of Medicine. He said this as a means of instructing medical interns to look for the most obvious, and likely, diagnoses first. The most obvious answer to a problem is usually the one that is correct, but not always. I’ve been thinking about this quote a lot over the last year or so, like a mantra. Think horses. It’s just a headache, you sit at your desk too much. Think horses. It’s only a little dizziness, vertigo? You don’t get enough sleep. Think horses. Your right ear is ringing, an infection? Think horses. Think horses. Think horses. Working as close to cancer research as I do can make you a little paranoid. I try hard to stay grounded, and remember that headaches are headaches for the same reason that hoof beats normally signal horses – it is simply unlikely for a headache and a little dizziness to be a harbinger of anything more. My symptoms were easy to downplay, but when I started to pay attention to what my body was trying to tell me, it was much more than a headache and a little dizziness. It was a piercing headache radiating from the back of my skull and wrapping around the front of my head to above my right eye. It was the additional emergence of my normal migraines with a ferocious new frequency. It was vertigo that left me feeling unmoored multiple times a day, everyday. It was diminished hearing in my right ear that left me missing whole conversations, and constantly repositioning myself so people could speak on my left. It was ringing, incessant ringing, in my right ear. Eventually, it was fatigue. I typically walk 45 minutes each way to work, and I hit the point where I dreaded having to get myself to the office. Of course, all this did not hit at once. It built up over the course of several months while I berated myself for worrying and reminded myself to think horses. I often joked with a colleague about the rare diseases I must have, things it’s absurd to think an otherwise completely healthy, 26-year-old would have. I kept expecting things to get better, like if I made it through the winter I’d magically start feeling like myself again (because that is clearly how the world works). I didn’t. The real drama started in February when my hearing loss had become a serious concern. I went for a hearing test that I passed, registering in the normal range. When the doctor who gave me the results told me I was fine, I stared at her in disbelief. I tried to explain that I couldn’t hear conversations that I couldn’t make out music and lyrics when my headphones were in my right ear. I tried to explain that identifying words was different from identifying tones like in the test, but the doctor just looked at me and said, “I trust my data.” As if I’m just making it all up. To my doctor’s credit, she didn’t let her concerns show, and since she was calm I was calm. She told me later when I mentioned my tongue she knew something was seriously wrong. She recommended I go for a CT scan of my head the next day. I took that day off work, and went for the CT in the early afternoon. It was quick and painless; I left the hospital around 3pm and took a cab home. I intended to go to work the next day since they weren’t going to find anything and all this was just to rule things out because, well, horses. I didn’t entertain the idea that my joking about rare diseases may have had merit. I called my older brother, and told him explicitly, the idea that the doctors would find something on the CT was silly, and I was going to be fine. Later that night my phone rang it was my doctor calling at 8:30pm with the CT results. It probably goes without saying that your doctor doesn’t call you personally at 8:30pm with good news. There are four ventricles in the brain. These ventricles are hollow cavities filled with your cerebral spinal fluid (CSF) the fluid that surrounds your brain. My fourth ventricle, the one at the back of the head, was compressed, putting pressure on the flow of CSF – but the CT didn’t show what was causing the compression. My doctor told me to go to the ER immediately, because I needed an MRI. Even then, I was completely rooted in denial. My health has been my privilege, I have never had any other medical problems, and I have a clear family history. It felt silly and paranoid to think it was anything bad. Yes, I took a selfie in the Emergency Department while waiting for an MRI. Since I needed to get myself to the ER, I called a friend. I don’t have any family in Boston, but my friends are incredibly supportive. When I called and said I needed a ride to the ER, the response was, “I just have to put on pants.” Another friend met us there, and we were taken back quickly. After a brief bit of confusion about why we were there (my appendix is just fine where it is, thank you) I was told I needed a consult from neurology. In the ER that night I saw two nurses, and three doctors (or four, around 1am I got kind of fuzzy, and I don’t remember any of their names). I did a lot of touching my finger to my nose and following the light with my eyes. I cracked jokes with my friends. We discussed the upcoming nuptials of another friend and the hotly debated issue of the wedding date. 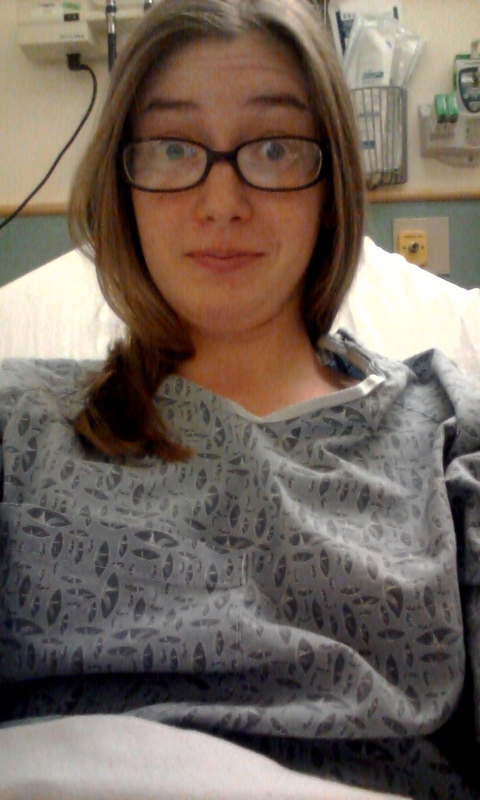 I wished I had sweatpants because those gowns leave a LOT to be desired. I wondered when I would get the MRI so I could get out of there and go home. Around 2am, I was told I was being admitted. I felt silly about it, like, I’m fine, horses and stuff, we’re just ruling things out this is not necessary. I just wanted to go to sleep. I kept getting asked if I had questions. I should have questions, shouldn’t I? I was too tired for questions. So, I just let them push me through the hospital to the neuro floor (riding a bed with wheels is a weird thing, for the record). I was incredibly concerned about the fact that I didn’t have my mouth guard to keep me from clenching my jaws, and didn’t want to sleep without it. I was assigned a room, and a nurse, and a tech. Vitals were taken for what felt like the 10th time. My friends were allowed to leave, and come back to bring me my mouth guard and a pair of sweatpants. By the time they headed home for the night, it was 3am. My nurse woke me at 6am to get me ready for the MRI. I’m not afraid of tight spaces, and I was sleepy, so I just let them do their thing. I was back in my room by 7:30am, ordering a bagel and coffee for breakfast. My friends returned and we spent the morning hanging out as if we were anywhere but the hospital. I was texting my parents, but didn’t want them to worry since it was all a lot of fuss for nothing, so I downplayed the situation. My primary doctor, who had ordered the CT and told me to go to the ER, came to see me that morning. It was reassuring to see a familiar face. She said they were waiting for the MRI results, and we’d know that day. Around mid-morning a group of doctors came in and asked me to go through the whole story and describe the events that had led up to me landing on their neuro ward. They said they would be back with the MRI results. My friends and I watched some mindless daytime talk shows. Then we watched the Jetsons, because daytime TV is the worst. It was early afternoon when the doctors came back. There were five of them, ranging from medical student to the neuro attending. There was more medical history, and touching my finger to my nose. They pricked my tongue with a pin. After this, they told me the MRI results. Sitting in that hospital bed on March 19 with my friend and five doctors staring at me, I heard the words, “we found a mass.” The doctors told me that I did have a tumor, but it wasn’t a type of tumor they often see – the MRI hadn’t shown a horse, in fact, I had a zebra. 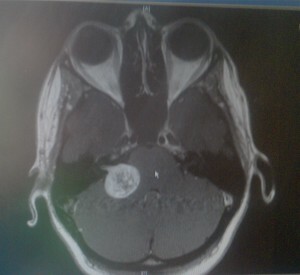 A copy of my MRI taken with my cell phone showing a very obvious tumor. One of the medical students (a nice guy, though perhaps a tad too gleeful about this) told me I have a type of tumor most medical students only get to see in textbooks. My tumor, in the inner ear, is called a vestibular schwannoma or an acoustic neuroma (the two are interchangeable). Your cerebral nerves pass through your brain and go out into your body to control all of your various functions. My tumor was growing on the eighth cerebral nerve (compromising my hearing) and putting pressure on the seventh (the numbness in my tongue because the seventh controls your face). It was between the cerebellum and the pons areas of my brain, and pressing on my brain stem. Your inner ear is where your vestibular system, which controls your sense of balance, is located. Vertigo, the dizziness and spinning sensations I’d been feeling, is a common symptom of vestibular dysfunction. The location of the tumor meant that in addition to ruining my hearing on the right, my vestibular system was also seriously damaged. According to the Acoustic Neuroma Association, these tumors affect one out of every 50,000 people and are typically diagnosed between ages 30-60. Any tumor is scary, let alone a tumor near your brain that is threatening your ability to move your face, but it also has a fantastic prognosis. I was told it is typically a slow growing tumor, so I’ve probably had it for years. These tumors are highly likely to be benign, meaning it won’t spread and become lethal. I write about neuro-oncology enough to know that operable is one of the sweetest words in the English language. I’ve had to talk to and tell the stories of family members who lost their loved ones to brain tumors that couldn’t be removed. I have never been so relieved by anything in my life as my zebra, because if it had been a more common type of brain tumor, I would face a very different outcome. Instead, there are treatment options, all of which end with a full recovery albeit with scars. For someone like me who has had headaches and vertigo symptoms for years, I may leave all this better than I’ve ever been – this tumor needed years to grow to reach 2.4cm, and I’ve been unknowingly living with these symptoms the whole time. I decided that, for me, surgery was the best option. I felt that it would give me the best chance of never having a recurrence, and would preserve my ability to move and control my face. When I went to meet with my surgeons, they retested my hearing. The results showed that my ability to hear out of my right ear was at 56% meaning that functionally I was right all along; I couldn’t hear conversations or make out words. Since the nerve damage to my hearing would not recover, I chose a translabyrinthine approach to the surgery, which cuts the eighth nerve making me deaf in my right ear. This was a heavy decision, but when I considered all the choices my parents, surgeon, and I agreed this was most likely to give me the best outcome. I was told that the timing of the surgery would be my choice, because this type of tumor was so likely to be slow growing, so I made plans to be away later in the month. My doctors asked me, while I processed things and made plans for my upcoming absence, to make sure to tell them if anything about my condition changed, particularly with regard to the feeling in my face. Since the tumor was seriously threatening the seventh cerebral nerve, the secondary goal for the surgery to remove it was to save that nerve. It could be the difference between having half my face paralyzed, I was told, and being completely normal. I kept being assured that I had time. A week after I was diagnosed with an acoustic neuroma, on March 26, I woke up unable to feel half of my face. On my right side, from my cheek to my chin, everything was numb.